Thailand (ประเทศไทย), officially the Kingdom of Thailand (ราชอาณาจักรไทย), formerly known as Siam (สยาม), is a country at the center of the Indochinese peninsula in Mainland Southeast Asia. It is bordered to the north by Myanmar and Laos, to the east by Laos and Cambodia, to the south by the Gulf of Thailand and Malaysia, and to the west by the Andaman Sea and the southern extremity of Myanmar. Its maritime boundaries include Vietnam in the Gulf of Thailand to the southeast, and Indonesia and India on the Andaman Sea to the southwest. With a total area of approximately 513,000 sq km (198,000 sq mi), Thailand is the world's 51st-largest country. It is the 20th-most-populous country in the world, with around 66 million people. The capital and largest city is Bangkok, which is Thailand's political, commercial, industrial, and cultural hub. 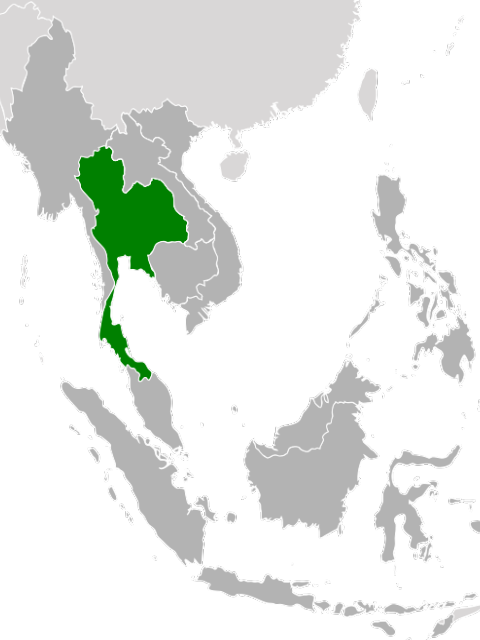 About 75% of the population is ethnically Thai. Thai Chinese, those of significant Chinese heritage, are 14% of the population (while Thais with partial Chinese ancestry comprise up to 40% of the population). Thai Malays represent 3% of the population, with the remainder consisting of Mons, Khmers and various "hill tribes". The country's official language is Thai and the primary religion is Buddhism, which is practiced by around 95% of the population. Thailand is a constitutional monarchy, under which form of government the King serves the People of Thailand as "Head of State". 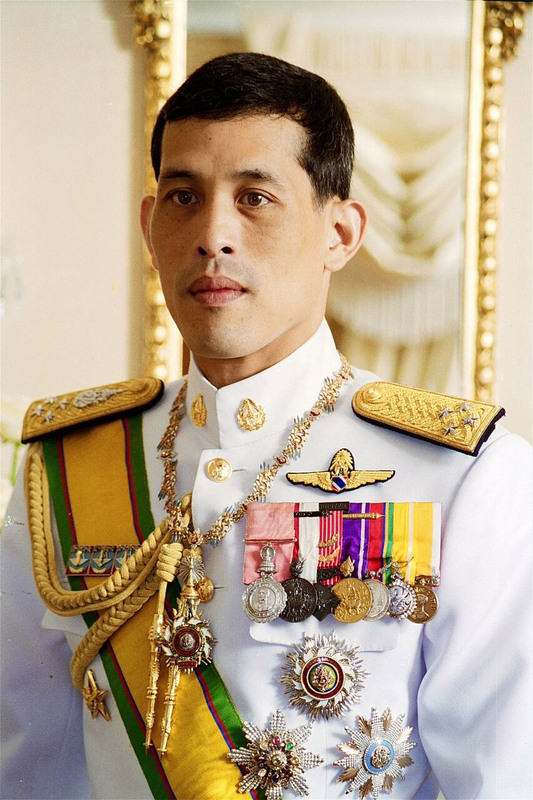 King Bhumibol Adulyadej, who has reigned since 1946 as Rama IX -- the ninth monarch of the Chakri Dynasty, is currently the world's longest-serving head of state and the country's longest-reigning monarch. 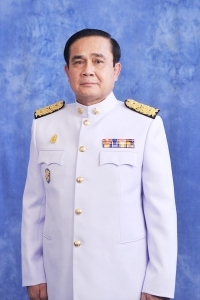 Since May 2014, the country has been governed by the National Council for Peace and Order headed by General Prayut Chan-o-cha, as the 29th Prime Minister of Thailand. Thailand experienced rapid economic growth between 1985 and 1996, becoming a newly industrialized country and a major exporter. Manufacturing, agriculture, and tourism are leading sectors of the economy. 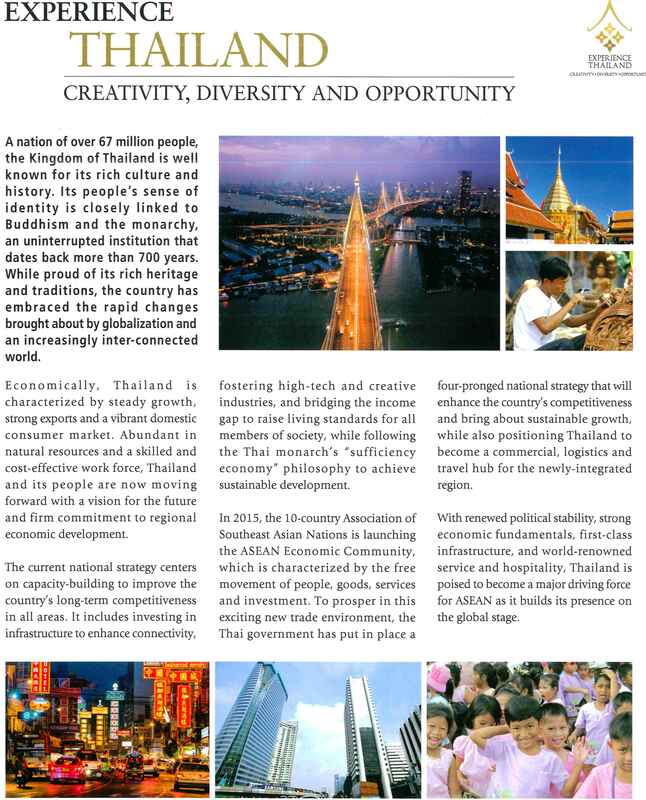 The rapid economic development of Thailand in the past decades brought about the expansion of industrial growth and diversification. 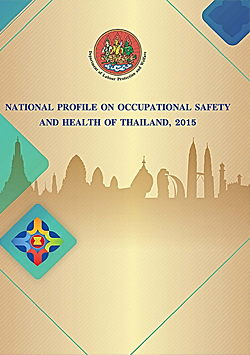 Although such development helped the Kingdom make remarkable progress towards prosperity, it has also presented Thailand with new challenges in a wide variety of fields, including occupational safety and health (OSH). The application of new technologies and new materials to the work process may all bring new hazards. As a result, workers are more vulnerable to safety and health effects including the risk of occupational accidents that cause injury, death, disability or chronic illness as well as other economic losses, both direct and indirect. OSH is therefore a crucial issue that is directly related to the life and security of the workers who are important human resources for the country development. 1972	The first OSH law came into force as provisions under the “Announcement of the Revolutionary Party No. 103 Re: Labour Protection”. 1976	Ministry of Interior released the “Notification on Safety and Health Welfare of Employees” under the “Announcement of the Revolutionary Party No. 103”. 1983	“National Institute for the Improvement of Working Conditions and Environment (NICE)” was established under the collaboration with the International Labour Organization (ILO). 1987	A series of 17 Notifications of the Ministry of Interior on various OSH aspects was issued. 1998	“Labour Protection Act, B.E. 2541 (A.D. 1998)” was promulgated, replacing the “Announcement of the Revolutionary Party No. 103”. 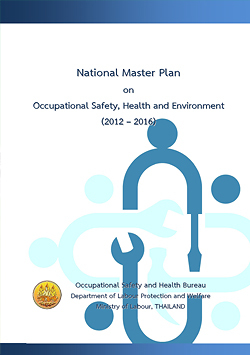 2002	The “1st Master Plan on Occupational Safety, Health and Environment” was developed and effective for 2002 – 2006. 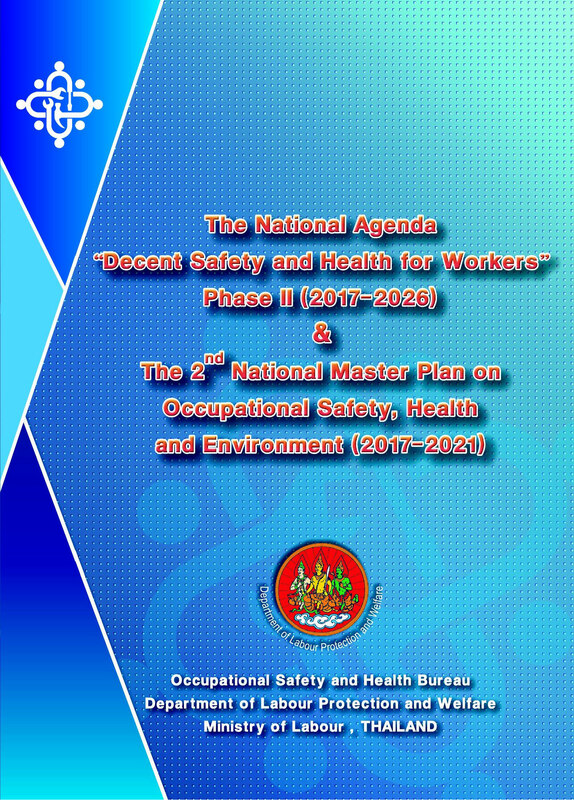 2007	The government announced the policy on “Decent Safety and Health for Workers” as the National OSH Agenda applied for all relevant sectors. 2009	OSH Bureau was established under the reconstruction of the organization and the authority of Department of Labour Protection and Welfare by merging the previous 2 agencies; the Occupational Safety and Health Inspection Division (OSHID) and the National Institute for the Improvement of Working Conditions and Environment (NICE). 2011	“Occupational Safety, Health and Environment Act, B.E. 2554 (A.D. 2011)” has become effective, as the main OSH law of Thailand. 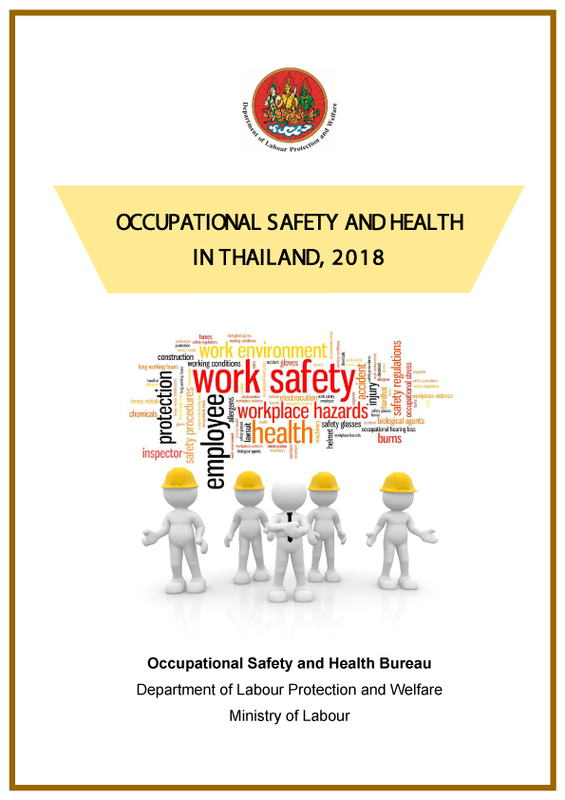 2014	“Thailand Institute for the Promotion of Occupational Safety, Health and Environment (Public Organization) was established by the virtue of the OSH Act 2011 as a functional unit for OSH promotion including OSH research activities. According to the data from Registration Administration Bureau – Ministry of Interior, Social Security Office – Ministry of Labour, and the National Statistical Office, total population of Thailand at the end of December 2014 was 66.17 million where 56.13 million were over 15 years of age. Of this group of population, 37.79 million were in labour force or available for work and 37.07 million were employed. Among these employed persons, 11.38 million were in agricultural sector and 25.69 million were in non-agricultural sector (manufacturing, construction, transportation, retail trade, service industry, and other businesses). Meanwhile, 0.48 and 0.24 million were unemployed persons and seasonal workers, respectively. Unemployment rate at the time was 1.3%. There were 20.8 million of informal workers in agriculture, trading and service sectors (including home-based workers, industrial outworkers and own account workers). A total of 14.64 million of employed persons registered with the Social Security Office - Department of Labor, and hence, be covered under the social security scheme. In addition, there were total of 435,303 establishments throughout the country. The total amount of compensation paid was 1,650 million THB (not include the cases that claiming was in progress and not decided by the end of December 2017). Various sets of Thai government during the past years had announced the national administration policy encompassing issues on labour management. These aimed at promotion and improvement of labour protection and welfare, with emphasis on employment conditions, occupational safety and health, as well as welfare and social protection. 4)	Developing effective mechanisms for the administration of occupational safety and health. Thailand, as one of the founding members of the International Labour Organization (ILO), has ratified the ILO Convention No. 187 -- Promotional Framework for Occupational Safety and Health Convention, 2006 (5th ASEAN member state to ratify this convention on 23rd March, 2016). ILO Convention No. 187 is one of the three key occupational safety and health instruments of the ILO. This Convention will enter into force for Thailand on 23 March 2017.